"Gus" is a placer gold miner and prospector from Folsom, California who's had gold fever since he was little guy and recovered his first color in the panning troughs at Knott's Berry Farm. Since I've been talking a lot about processing black sand concentrates lately, I thought you'd like to hear how "Gus" goes about it. "Regardless of the process (sluicing, highbanking, etc.) I use out in the field I always bring my black sand concentrates for further processing at my leisure. My first step in further concentration is accomplished by using a 'California Bucket Sluice Concentrator.' 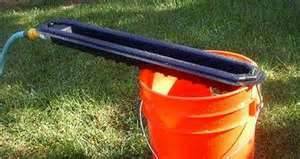 This inexpensive device employs a very simple 'drop riffle' design. However, it can take quite a bit of trial and error to understand the 'Bucket Sluice's' water flow requirements to prevent potential loss." "I place the bucket and the concentrator in a mortar pan and use plenty of 'Jet-Dry' rinse agent. Mine is a recirculating system where the water is delivered via a small bilge-type pump that I regulate using a Pulse Width Modulator (PWM). The PWM controls the water flow. I don't use a ball valve because the PWM is a much more granular and repeatable control method. Also, the PWM doesn't introduce additional turbulence into the water stream like a ball valve can. 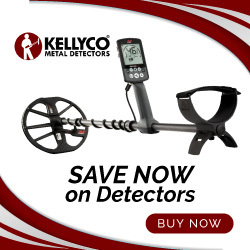 It also has the added bonus of making my 12-volt batteries last longer." "Gold Down to Microscopic Size"
"The 'California Bucket Sluice Concentrator' can exchange material quickly and efficiently, capturing gold and black sands down to around 50 mesh. After my first run, I take the concentrates and dump them into a conventional gold pan for final clean up. When this step is complete, I classify the tailings from my 'Bucket Sluice' using a 30-mesh classifier. Anything that doesn't make it through the 30-mesh screen gets panned again. Next, I take the minus-30 mesh material and classify it again using a 50-mesh screen. I then take the 30-50 mesh material and pan it twice...usually I recover a little more color this way." "Now I'm left with minus-50 mesh material and any jars of black sand derived from using a magnet out in the field. 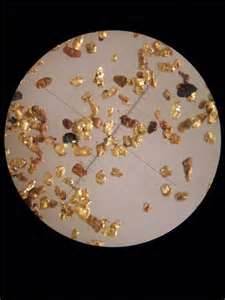 This is usually very heavy material containing gold down to microscopic size and lots of iron. 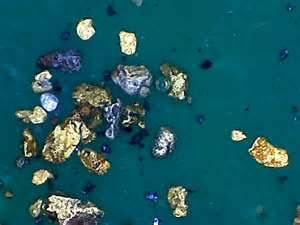 To tell the truth, I've been surprised at the amount of very fine gold I've seen in this final group of material." "In the next step I take the minus-3-mesh material from the 'Bucket Sluice' and place it into one of my various sized, home-made fluid beds (depending on how much material I have, that is). I get the flow running in the fluid bed (FB) just enough to get the material moving, but not fast enough to make it exit. I then take a gold magnet and hover it over the top of the water circulating in the FB and occasionally dipping the magnet just under the water." "As the material churns inside the FB, iron is brought to the top and onto the magnet. This removes three quarters or more of the overall material, leaving behind any gold and other non-ferrous material. I've check what gets attracted to the magnet many times, but I've yet to find more than a microdot of color. The iron picked up from my gold pan or sluice box can contain quite a bit of gold still encapsulated among the black sand particles. However, the same material and magnet do not encapsulate the gold when used in conjunction with my FB. So, this approach works." There's more to come from "Gus" on the subject of gold recovery from black sand concentrates, so stay tuned. If you liked this post, you may want to read: "Gold in the West: Idaho (Part 4)"
Again, my take is that anytime you're processing large volumes of material you should run your black sands and derive the last bit of gold from those concentrates. What large volumes of material means to me may be different for others. I can say I don't mess with them at all when I'm only out for a day or only processing small amounts of gold-bearing gravel. But that's me...others will carry their black sands home no matter what. Best, J.R.